We are pleased to announce new office hours effective November 20th, 2010. 7:30 a.m. to 1:30 p.m.
All times are based on appointment. 10:30 a.m. to 11:30 a.m.
Allasso Chiropractic is located in Newtonville, MA at 46 Austin Steeet, Suite 101. From the MBTA Commuter train (Framingham Line), Newtonville stop: turn south (left at the top of the stairs) onto Walnut street and walk a half block to Austin Street. Turn right and walk about half-way down to #46 on the left. The entrance to Allasso Chiropractic is at the back up the ramp. 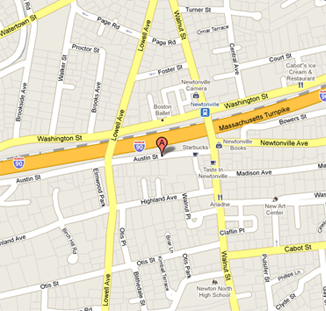 From the Mass Pike coming from the east, take the Newton Center exit and continue on Washington Street going west. Take a left turn onto Walnut Street going over the Mass Pike. Immediately after the overpass is Austin Street. Turn right and follow until after the municipal parking lot on the left and just past the Rockland Bank. Turn left into the driveway of 46 Austin Street to the rear parking lot. The entrance to Allasso is in the back up the ramp. From the Mass Pike coming from the west, take the West Newton exit and follow the signs to Commonwealth Ave heading east. Turn left onto Washington Street and continue (going through West Newton Village) to Lowell Ave. Turn right onto Lowell Ave going over the Mass Pike. Immediately after the overpass, turn left onto Austin Street. Allasso Chiropractic is on the right. Parking is in the rear and the entrance is in the back up the ramp.